From acclaimed director Michael Bay (Armageddon, Transformers) comes the incredible true story of six elite ex- military operators who fought to protect the CIA against overwhelming odds when terrorists attacked a U.S. diplomatic compound on September 11, 2012. Starring John Krasinski ('The Office', 'It’s Complicated'), James Badge Dale ('World War Z', 'The Departed') and Pablo Schreiber ('Orange Is The New Black', 'Vicky Christina Barcelona'), the film is based on the nonfiction novel 13 Hours: The Inside Account of What Really Happened in Benghazi by New York Times best-selling author Mitchell Zuckoff with the members of the Annex Security Team. On September 11, 2012, Islamic militants attack the U.S. Consulate in Benghazi, Libya. Stationed less than one mile away are members of the Annex Security Team, former soldiers assigned to protect operatives and diplomats in the city. Led by veteran Tyrone S. Woods (Dale), contractor Jack Da Silver (Krasinski) and Kris Paronto (Schreiber), the men must take matters into their own hands and engage the combatants in a fierce firefight to save lives. The '13 Hours: The Secret Soldiers of Benghazi' competition has now closed. Winners will be announced shortly. Competition opens at 5pm AEST on Sunday 10th July 2016 and closes at 11:59pm AEST on Sunday 17th July 2016. Five winners will be chosen at random on Monday 18th July 2016. To successfully win, entrants must fulfil the above entry conditions before the time the competition closes. Current members/followers are eligible to enter the competition. Only one entry per person. Only one winner per household. To be a valid winner, the entrant must not have won a prize from SWITCH within the last 28 days. Each winner will receive one Blu-ray copy of '13 Hours: The Secret Soldiers of Benghazi'. By entering, you agree to receive occasional emails from SWITCH in the future. If you decide to unsubscribe from these updates, any further entries will not be applicable. Only Australian residents are eligible to enter. 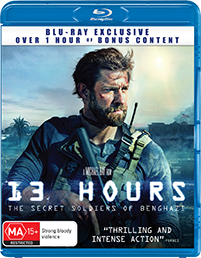 '13 Hours: The Secret Soldiers of Benghazi' is available on Blu-ray, Digital and DVD on Thursday the 14th July 2016 from Universal Sony.